Joan's Blog: Foodie Pen Pals the Second! Foodie Pen Pals the Second! I love Foodie Pen Pals. You send people nice things, and other people send you nice things in return. It's always fantastic to get a parcel in the post, and with FPP the parcel is full of good things to eat - what could be better? So this month's package came from Nick in London, who writes 'The Baking Process' - very prolifically, I might add. If that's a word. You can find her blog here, and let me tell you it contains some serious deliciousness. I asked Nick to send me any local specialities or favourites she thought I'd like to try, however for someone living in London, that doesn't exactly narrow it down. 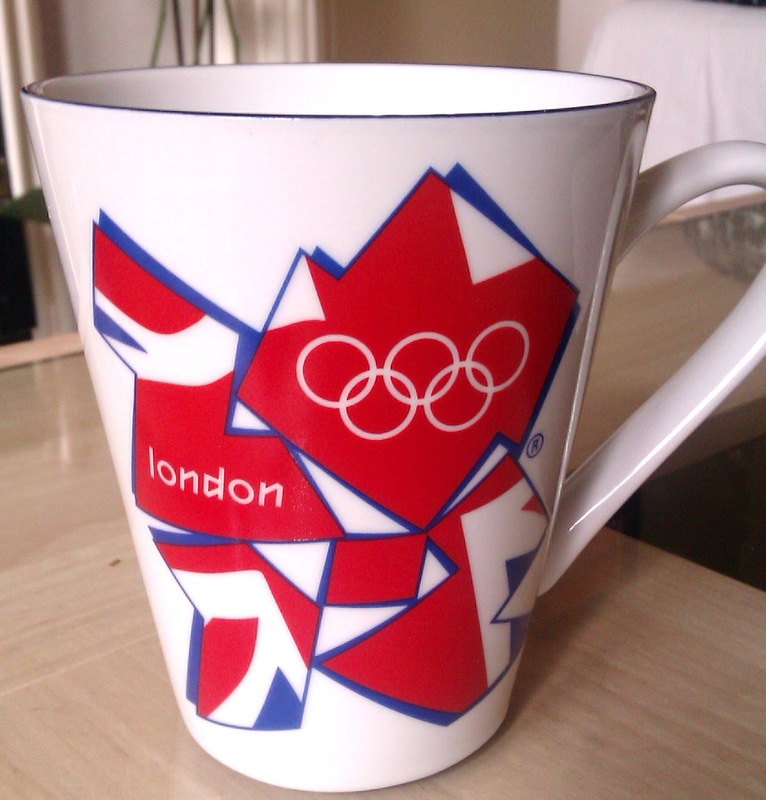 She rose to the occasion admirably, however, basing her parcel on her experience as an Olympic volunteer, which is pretty much a blog post in its own right. I can't say I'm a huge fan of this logo but this is nonetheless a very nice mug and I'm sure I shall enjoy many delicious beverages therefrom. Who knows, perhaps I shall even imbibe some of the Olympic spirit and in four years' time you'll see me haring down the 100m track leaving even The Mighty Usain in my wake. Along with the mug came a Nature Valley snack bar, which was one of the snacks provided to Olympic volunteers. It so happens I've tried these before and really like them, they're a lovely, crunchy, satisfying blend of sweetness and oaty, nutty goodness and mine, you'll note, had an OFFICIAL OLYMPIC STICKER on it! Oh, I am awash with reflected glory. 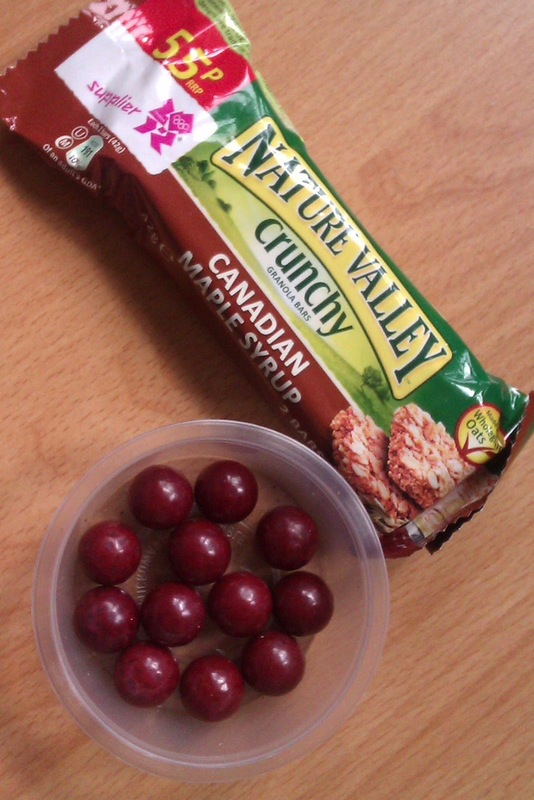 Next to it in my photo is a tub of aniseed balls, which are a real taste of childhood. I remember seeing them in big jars in various local shops where you could buy a 'quarter' of whatever took your fancy with your pocket money. If this doesn't make sense to you, don't worry, it's because I am from The Past and they sold sweeties differently then. 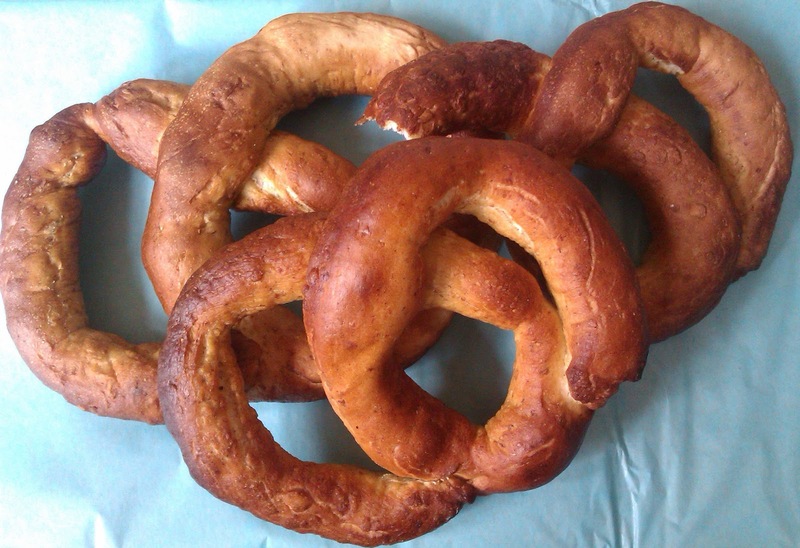 Continuing the Olympic theme, albeit unintentionally, Nick had made me some soft pretzels. Now, what with Nick living in London, I assumed she would be English but no, in fact she is American and these are one of her very own childhood favourites. Look what happened when I took the photo! Bready Olympic rings! Well, sort of. I didn't intend for them to be. But Nick's parcel was clearly having a subliminal effect. You'll note, if you look at the photo closely, that I couldn't in fact wait to try them until after I'd taken it. Greedy Joan! 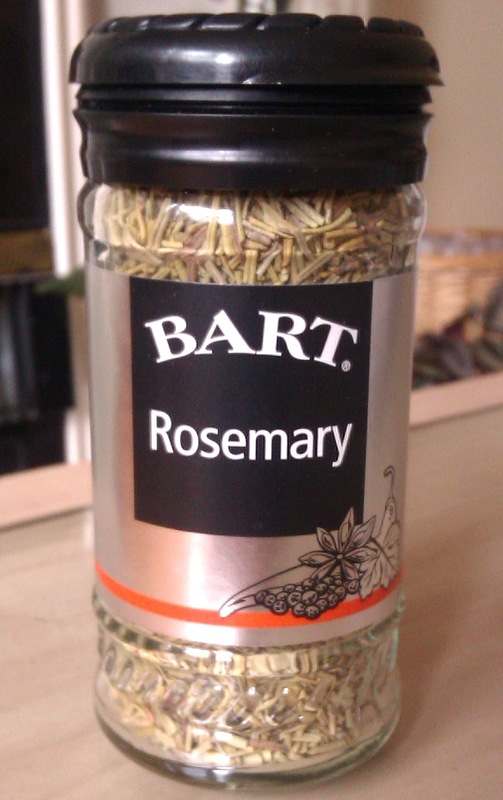 The flavour was like a mild sourdough, and let me tell you, when I toasted these bad boys up and dunked them in my bacon, lentil and spinach soup they were really delicious. I also think they'd be fabulous dipped in really good olive oil and salt, vinegar or dukka. As I have eaten them all, I'll have to test that theory by trying the recipe for myself. I'm happy to say I have been provided with a copy, but it's also on Nick's blog, right here. Sadly the picture doesn't capture their lovely pastel colours, or the amazing vibrancy of those colours inside the meringues. But then again, neither does it capture the beautifully soft and sweet taste; the crispness of the shell, and the slightly chewy but not sticky inside, all of which were there all the same. 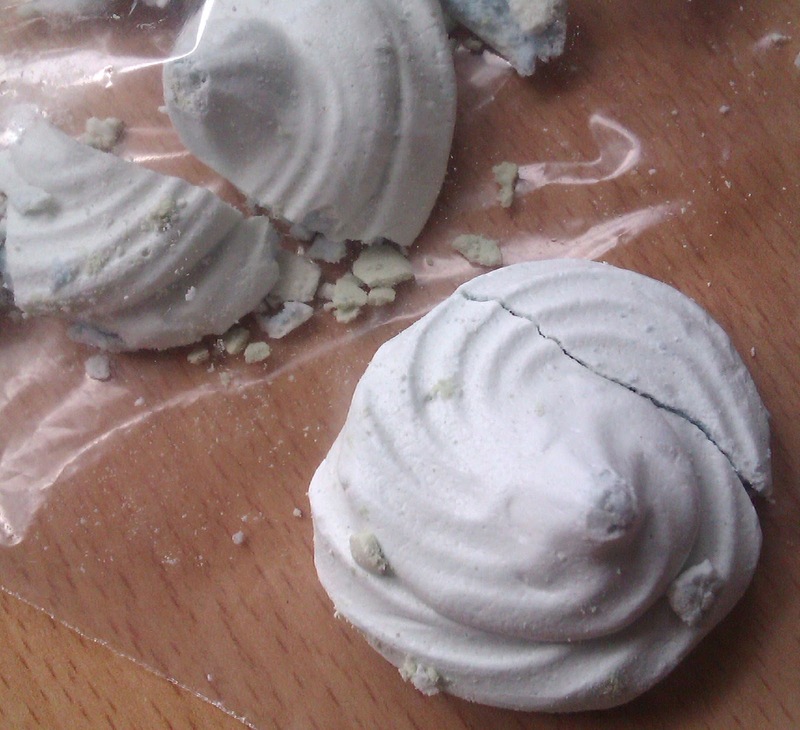 In my experience, it's fairly difficult to make really good meringues and these were, most definitely, really good. (They were, incidentally, inspired by The Bourne Legacy, the latest in the action flick series previously starring that guy, you know the one I mean), although you'll have to read Nick's blog to find out exactly how. And no, they weren't used as weapons. 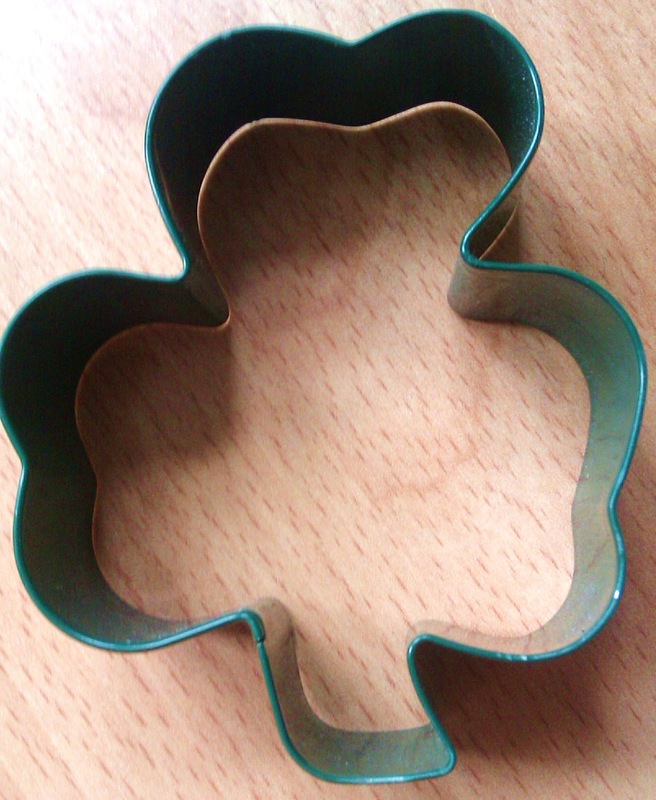 The last two items in Nick's awesome parcel were a jar of rosemary and the sweetest little shamrock-shaped cookie cutter. The rosemary because, she says, she finds it really difficult to get hold of so she thought I might have the same problem, and the cookie cutter just because it's so cute! I think that's downright thoughtful, and that's one of the other things I love about FPP - it puts you in touch with really nice people, and that's the only thing better than a lovely big parcel of good things to eat. Thank you, Nick, for a lovely, thoughtful and entertaining parcel. I hope you got as much enjoyment from the one you received as I did from the one you sent! Callie, who received a parcel from me, will be writing a guest post about it. Watch this space! Foodie Pen Pals is operated in Europe by Rock Salt. It's based on an idea from The Lean Green Bean, which set up the scheme for the US and Canada. There are around 1600 participants all over the world. Get involved! I think you described my parcel better than I did! So glad you enjoyed it, and the Olympic rings of pretzels?! SO adorable! Another fab parcel, love the Olympic ring pretzels. I'm gonna report you for using it without authorisation, of course. Hi. Thanks for visiting. This is an entirely random collection of thoughts, ideas, rants, raves and general musings. Or at least, that's the idea. We shall see how it develops. Joan Grady 2012. Simple theme. Powered by Blogger.